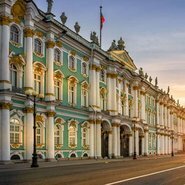 Join us for a screening of the film The Winter Palace and the Hermitage in 1917 , created by the Hermitage Foundation UK to record the installation and display of an exhibition in the State Hermitage Museum, marking the centenary of the Russian Revolution. The Revolution marked the beginning of a new chapter for the palace, and the shift to a museum for the people. See the great baroque palace and historical footage from the revolutionary period, alongside key exhibits in the show. In the museum’s own words: ‘History was made here’.